The Broward County PBA Scholarship Committee is now accepting applications for our 2019 college scholarship fund. This scholarship is awarded once a year to the son or daughter of a Broward County PBA member. Before you complete the online application, please read the following rules and eligibility requirements. You will need to provide documents to accompany the online application. 1. Be the son or daughter of a Broward County PBA member who has been a member for a minimum of two years and is currently in good standing. 2. Be, or plan to be, a part-time or full-time student at an accredited two- or four-year college or university. When it comes to active shootings in our schools, the elected officials still seem to have more questions than answers. If you were the superintendent of a school system, would you treat threats against a school as a criminal justice issue or a mental health issue, and what safety procedures and/or policies would you implement that would make our schools safer for everyone, without infringing on individual rights? Those applicants that cannot access the online application or wish to fill out a paper version of the application instead can call the PBA office to have a PDF version of the application packet emailed or faxed to them. The completed application and essay should be mailed to the address below or faxed to (954) 583-0405. Applicants should realize that many scholarships are based on financial need as well as merit. The information furnished will be kept strictly confidential. The application deadline is April 30, 2019, at 4:30 p.m. 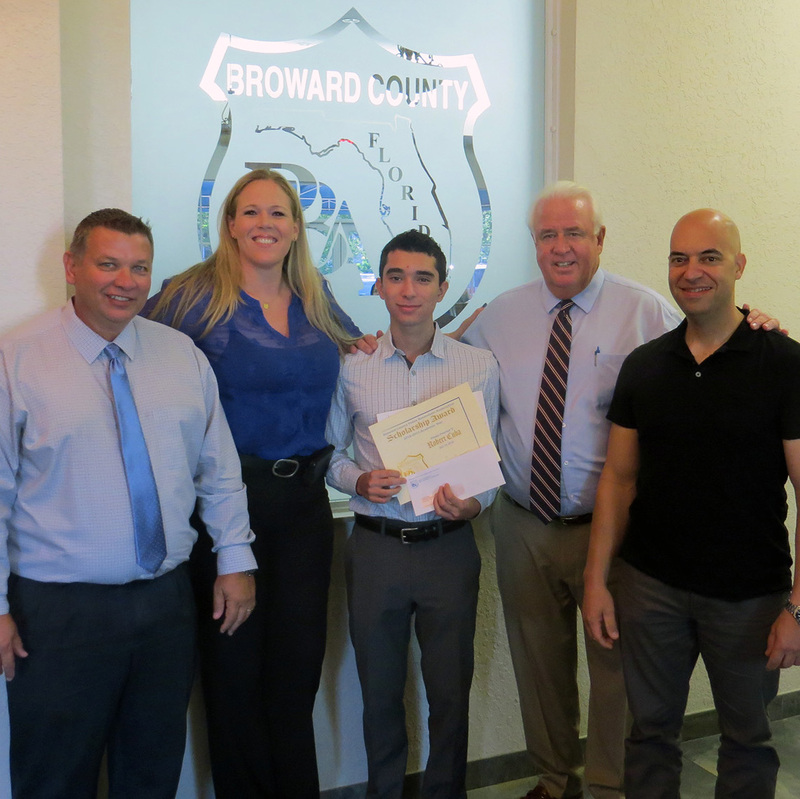 The Broward County Police Benevolent Association, Inc. (BCPBA) presented awards to the winners of its annual college scholarship essay contest at its quarterly board of directors meeting held on July 19, 2018. This year’s first place winner is Robert Cuba of Pembroke Pines. Robert received a $1,200 scholarship, which will be applied toward his education at the University of Florida. The first place scholarship award was sponsored by Matthew Oppedisano of the Wellington, Florida-based Law Enforcement Retirement Advisory Service. The second place winner was Lexi O’Brien of Fort Lauderdale. Lexi received a $600 scholarship, donated by Richard Applefeld, and will be applied toward her education at the University of Central Florida. The remaining winners each received scholarships in the amount $500 from the Broward County PBA. The third place recipient was Brianna Costello of Jacksonville. Brianna is currently attending the University of North Florida, and will continue to do so through graduate school. Taylor Seldin of Boynton Beach earned the fourth place award, and will be attending the University of Central Florida. The fifth place winner was Lesley Cosme of Riverview. Lesley will be attending Penn State University. The Broward County PBA Annual Scholarship Award was founded in 2003 as part of The HOPE Fund’s mission to assist the children of law enforcement members in their effort to attend college. To be eligible for the scholarship, participants must be the son or daughter of a Broward County PBA member in good standing and plan to be a part-time or full-time student at an accredited two- or four-year university. More information about the scholarship can be found at bcpba.org.